Una casa para vacaciones diferente. Seal Rocks es un pueblo pequeÃ±o y Ãºnico, muchas viviendas existentes son bÃ¡sicas chozas de pesca, ahora utilizas sobre todo para las vacaciones. La intenciÃ³n era construir una casa de vacaciones sin complicaciones, que tambiÃ©n podrÃ­an ser liberados para la renta de alquiler. El enfoque era construir de una manera que conserva el lenguaje de las formas existentes construidas de Seal Rocks y ser respetuoso de contexto. Hay un ligero aumento en el sitio en la parte trasera y una perspectiva para el monte, delante y detrÃ¡s. El Servicio de Bomberos Rural colocÃ³ un revÃ©s 10m en la parte posterior, forzada una valla de fuego y le dictÃ³ que todos los edificios de la calle tenÃ­an que ser parcialmente zona de flama y el nivel 3 de protecciÃ³n incendios forestales. El edificio se centra en el espacio central para minimizar la cantidad de cristales exteriores reduciendo asÃ­ la cantidad de tratamientos costosos. Se mejora el sentido de la vida privada y anexo a la sala de estar al aire libre. El borde que rodea el techo interno permite la circulaciÃ³n protegida bajo el alero, reduce la forma construida y oscurece los interiores y de transiciÃ³n al aire libre. TambiÃ©n enmarca una visiÃ³n del cielo que estÃ¡ animada por la noche por la luz de un faro que pasa por encima. Kurreki 'nombre', ('Myrtle Bush "en la lengua Worimi), la sensaciÃ³n de la casa es uno de los camping de lujo. Ser capaz de cerrar el perÃ­metro exterior hace que todas las habitaciones se pueden abrir a la cubierta central. Esto le permite dormir bajo mosquiteros, con vistas del cielo nocturno. Un amplio vestÃ­bulo de entrada sombreada es para el almacenamiento de tablas de surf, colgando toallas y trajes de neopreno, mientras una lluvia de arena cercanasse extiendeÂ por toda la casa. El espacio mÃ¡s popular es la cubierta de hamaca a la sombra, que recibe uso constante. Materiales que buscan relacionarse con el contexto de la aldea, son econÃ³micos y resistentes a la corrosiÃ³n. No hay <materias ciudad> como splashbacks vidrio, cerÃ¡mica o piedra pulida. Las paredes estÃ¡n cubiertas con revestimiento de 9 mm de CFC y canales de aluminio, al igual que los edificios existentes de fibra. 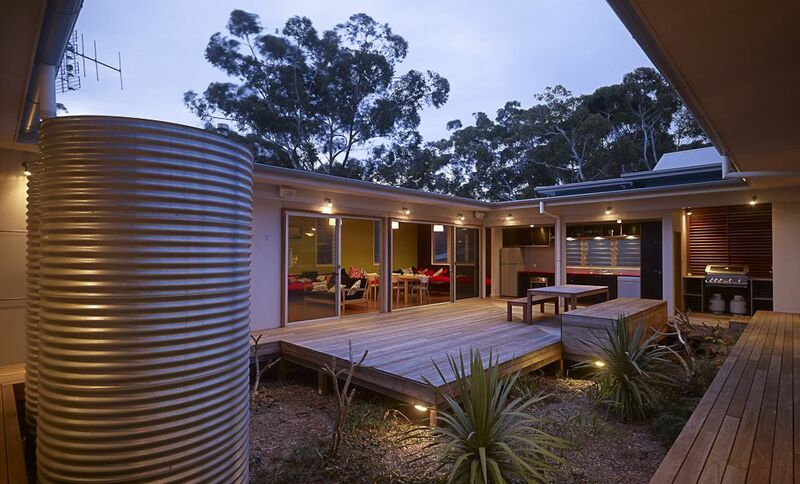 Localmente decking blackbutt blanqueado y techos orbe personalizados son otros materiales dominantes, tanto de los cuales se utilizan en los edificios existentes. Los mÃ©todos de construcciÃ³n y los detalles son intencionadamente bÃ¡sicos, por razones de economÃ­a y de trabajo con los comerciantes locales. El acero se trata de evitar y elementos como el sistema de alumbrado exterior sion de plÃ¡stico, y fueron elegidos tanto por la economÃ­a como por su la larga vida. Los pisos son de partÃ­culas de pulido, carpinterÃ­a de todos los usos formply . El exterior es simple, gris y plata, mientras que el interior estÃ¡ lleno de color, inspirada en rockpools y la vecina selva. Una granja de humedad trata de aguas residuales, el techo se alimenta y 27000 litros de almacenamiento de agua para uso domÃ©stico, con un 15000L adicionales para lucha contra incendios. Para una protecciÃ³n adicional de una bomba suministra los rociadores contra incendios en la cobertura y el nivel de jardÃ­n con la oferta interna. Algunas de estas tierras en el techo, a continuaciÃ³n, vuelve a circular, que se extiende el tiempo de protecciÃ³n. Seal Rocks is a small, unique village, many existing dwellings are basic weatherbeaten fishing shacks, now mostly used for holidays. Thomas road, was developed later and the last 10 blocks in the street only became available in 2003. 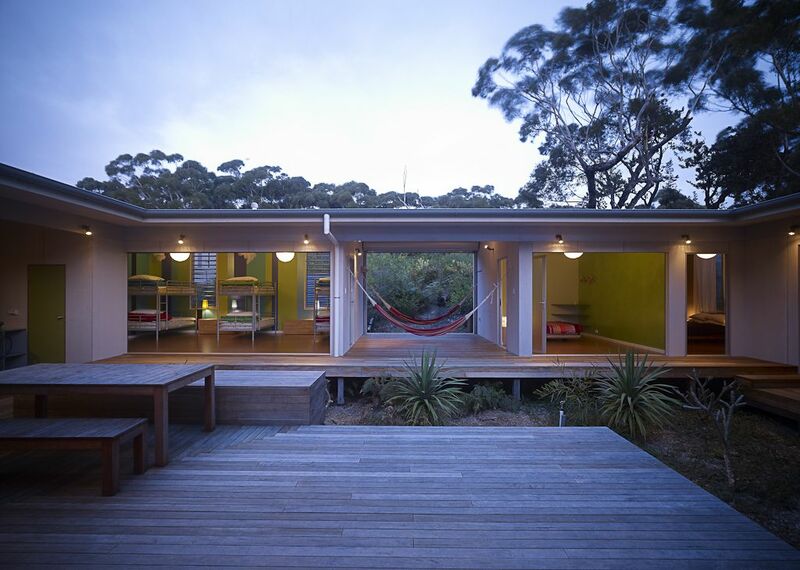 The intention was to build an uncomplicated holiday house, which could also be let out for rental income. The existing original cottages are slowly being lost as properties change hands, so the approach was to build in a way that retains the language of the existing built forms of Seal Rocks and to be respectful of context. 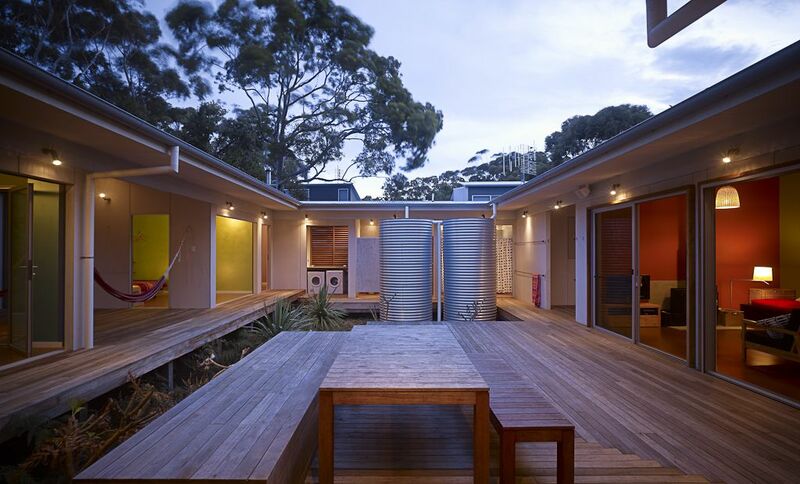 There is a gentle rise on the site to the rear and an outlook to the bush, front and rear. The Rural Fire Service placed a 10m setback to the rear, enforced a fire fence and dictated that all the buildings in the street had to be partly flame zone and level 3 bushfire protection. 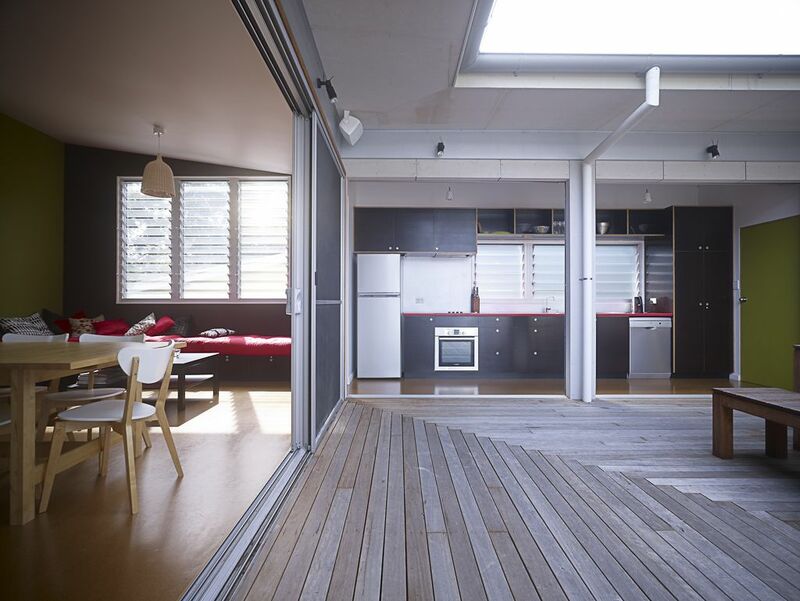 The building focuses to the central space to minimise the amount of external glazing thus reducing the amount of expensive bushfire treatments. It improves the sense of privacy and enclosure to the outdoor living area. The surrounding internal roof edge allows protected circulation under the eaves, reduces the built form and blurs the indoor/outdoor transition. It also frames a sky view which is animated at night by the lighthouse beam passing overhead. Named â€˜Kurrekiâ€™, (â€˜Bush Myrtleâ€™ in the Worimi language), the feel of the house is one of luxury camping. Being able to close the outer perimeter makes all rooms openable to the central deck. This allows you to sleep under mosquito nets, with a view of the night sky. 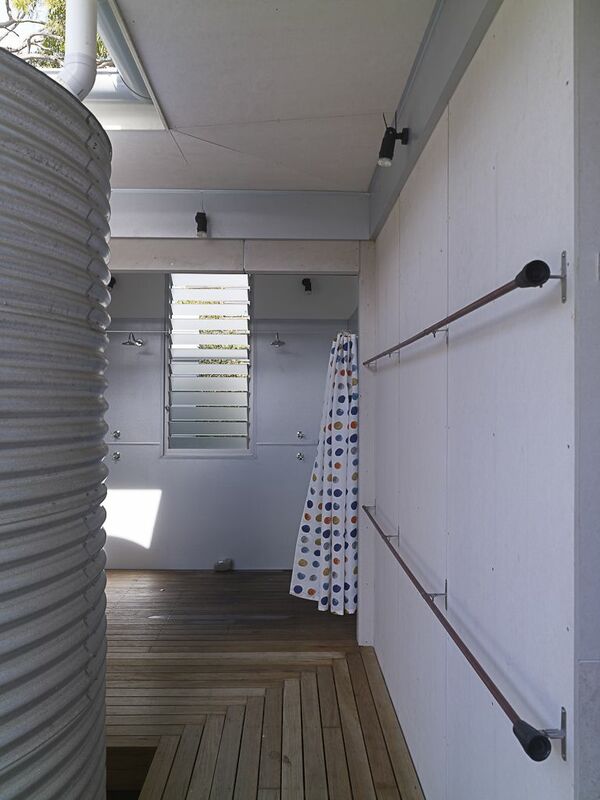 A wide shaded entry foyer is for storage of surfboards, hanging towels and wetsuits while a shower nearby reduces sand spreading throughout the house. 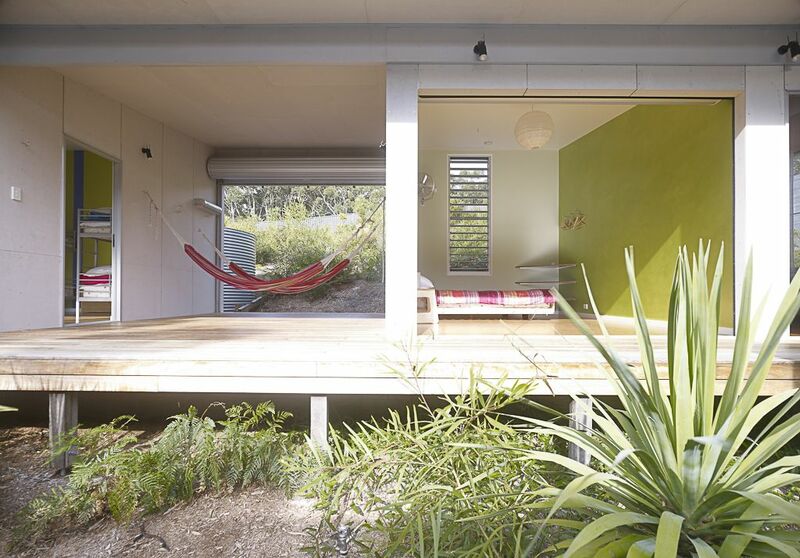 The most popular space is the shady hammock deck, which receives constant use. Materials throughout relate to the context of the village, are economical and corrosion resistant. There are no â€˜cityâ€™ materials like glass splashbacks, ceramic tiles or polished stone. The walls are lined with 9mm CFC cladding and aluminium channels, much like the existing buildings of fibro and cover batten. 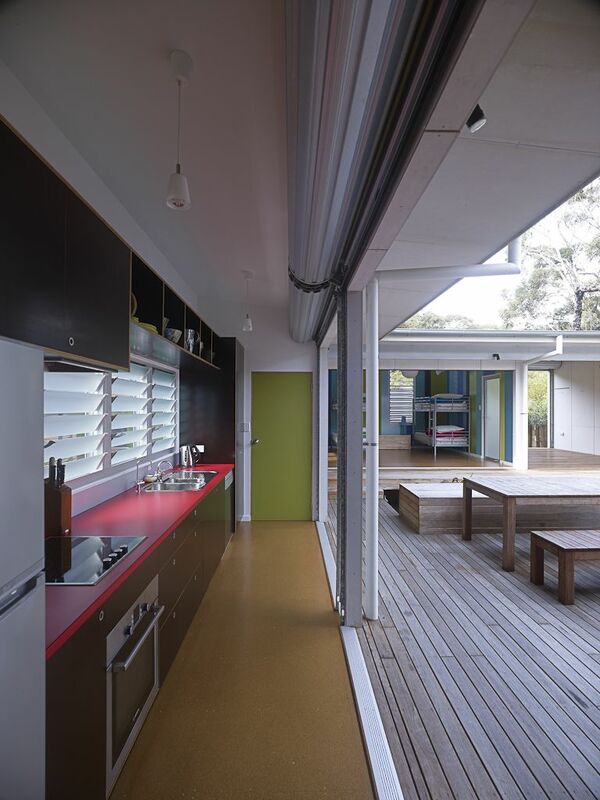 Locally milled blackbutt decking and custom orb roofing are other dominant materials both of which are used in existing buildings. Construction methods and detailing are intentionally basic, for reasons of economy and working in with the local tradesmen. Steel is avoided and items such as the plastic external light fittings, were chosen both for economy and long life. Floors are polished particleboard, all joinery uses formply as a finished face. 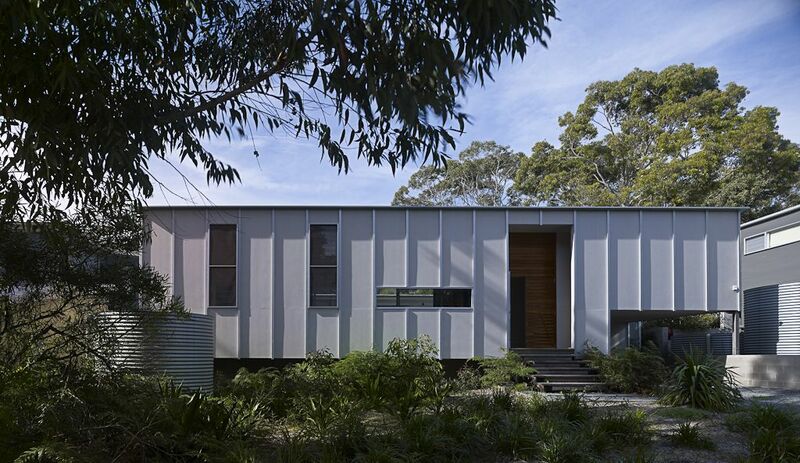 The exterior is simple, grey and silver, while the interior is colourful, inspired by rockpools and neighbouring bush. A wet composting worm farm treats sewage, the roof feeds toÂ 27000 L of water storage for domestic use, with an additional 15000L for firefighting. For extraÂ protection a pump supplies the fire fighting sprinklers at roof and garden level with the domestic supply. Some of this lands on the roof, then recirculates, extending the protection time.